Monday – 10th November 1862: This first Lambeth Bridge is opened. It would soon fall into disrepair, and in 1932 it would be replaced with the structure we know today. Tuesday – 11th November 1688: A Benedictine convent in St. John’s Square, Clerkenwell, is destroyed by an anti-Catholic mob during the revolt against King James II. Wednesday – 12th November 1974: A 9lb salmon is caught in the Thames – the first time that such a fish has been caught in the dirty old river since 1834 – and sent to the British Museum for identification. Improvements in the water quality are hailed. Thursday – 13th November 1642: During the First English Civil War, the Royalist and Parliamentary armies face off against each other in the Battle of Turnham Green. Friday – 14th November 1973: Princess Anne marries Mark Phillips at Westminster Abbey. Well Groucho would be happy today, but he might have packed his bags tomorrow, as there is some tentative hope of things brightening up as the week progresses. 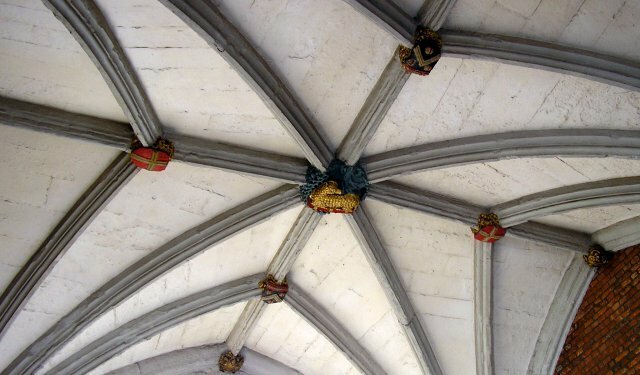 The photo is of the underside of St. John’s Gate.